Being a Gaelic Polytheist that does not currently have a Gaelic Polytheist community at hand, I spend a lot of my time and effort being a public priestess in a interfaith pagan coven known as CAYA Coven as I have found the community aspect to be so very enriching to my life and practice. Over the years CAYA has grown to the point where we can now group off into devotional affinity groups of priestesses that share a deity or culture or other grouping. One such groups that I am apart of is the Cauldron of the Celts. All of us publicly dedicated to deities that fall under the “Celtic” umbrella. Currently that means Irish and Romano-Breton but in future could include Gaulish, Welsh and so on. Being a multi-faith group means that everyone is coming from a different angle as far as practice and so forth but I have to say that it has been refreshing to have more people to talk about the lore and cultural background of things, as well as be able to share our devotions and put on some truly wonderful rites for the gods. In that vein we have collective decided it would be a good idea to start a Sacred Calendar year for the group, with a holy day selected for each of our dedicated deities. Understanding that nothing about this is particularly Gaelic but a more modern adaptation to further foster reverence and honor to the gods. It also provides an opportunity to share with the wider community, and be of service. With that being said the first day of reverence this year starts with Brigid, and below is a humble offering for all those who feel called to partake. The Cauldron of the Celts, a multi-faith devotional group within CAYA Coven, is endeavoring to establish our Sacred Calendar Year. Each priestess is publicly dedicated to a deity who falls under the wide “Celtic” umbrella and has chosen a date on our modern calendar year to be a day of reverence to their deity. In an effort to connect with other devotees and be of service to the public we share this calendar and some of our own workings, that we may all raise up the Gods names in honor. Our calendar year begins with Brigid’s holy day on Feb 1st. The priestesses of Brigid, Foxfire Kells and Doyenne Rowan, invite you to send us any petitions you wish to make before the goddess and we will offer them to her in supplication and gratitude on her holy day. You may email them at cauldronofthecelts@gmail.com. Imbolc is celebrated in honor of the goddess Brigid between January 31st and February 2nd; the name of the holy day comes from the Old Irish imbolg or oimelc, meaning “in the belly,” referring to the season of lambing and ewe’s milk. Brigid emerges from the silence of winter to herald the coming of spring and new life and growth; she is also a goddess of the forge, of the hearth, of poetry and inspiration, and of healing. Her symbols include lambs or sheep, wells, writing implements, acorns, apples, milk, snowdrops and crocuses, and, of course, fire. Imbolc falls during the Celtic tree month (a neo-pagan construct based on Robert Grave’s interpretation of the ancient symbolic language of ogam) of Luis (lweesh), which is the Gaelic name for the rowan tree, so one activity you can do is to make a protection charm of 2 crossed rowan twigs bound with red thread. For more information about the history of the Rowan and red thread charm you can find a incredibly thorough article here. Another one of Her traditions is to leave out cloth or clothing to be blessed by Brigid on Imbolc, often to be used for healing and protection purposes for the following year. Given the current events happening, Her face of healing is very clearly one that is needed in the world and in our community. Arrange around the candle 3 acorns and/or apples, a small bowl of fresh water (spring water or melted snow is ideal), a sprig of juniper, and a small bundle of wool roving. Prepare an offering plate with a piece of bread spread with soft cheese and a drizzle of honey, and some apple slices. Light the candle and contemplate what new projects or endeavors you want to nurture this year. How will you tend to these goals? How will you tend to yourself? What parts of yourself or your life are beginning to emerge with the Spring? How do you keep the fires of your creativity and motivation burning as the year wears on? Do you make space in your life for pleasure and the warmth of family (however you define it)? Say a prayer or sing a song to Brigid to bring her into the room. and give the promise of renewal. for the many ways you bring joy and beauty to life in the world. ever may the embrace of my favour glorify your name. Offer Brigid the bread with cheese & honey and the apples, for sweetness and sustenance. 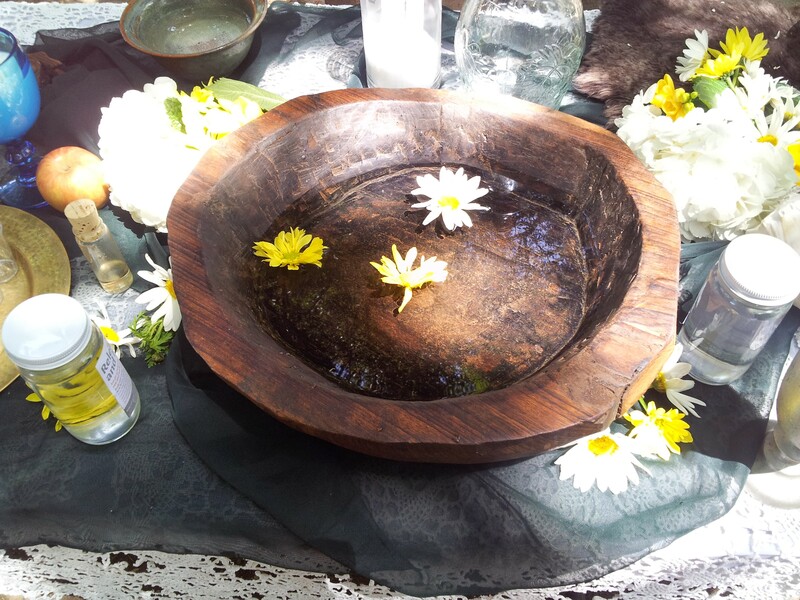 Dip the juniper sprig in the water you have charged and asperge your house to bless and protect you in the coming year.